It is sad to see how the very few cinemas of the country have over time become victim to neglect and vandalism. Recently, at least six cinemas were burnt to ashes in Karachi – cinemas where many of us can remember spending our weekends at with families and friends – relishing the bottle of soda and a bag of plain salted chips. Where new multiplexes with state of the art technology are now emerging in the bigger cities of Pakistan, it is still troublesome that the government is not interested in providing any kind of assistance or security to those groups interested in restoring and renovating the old cinemas which had once seen very glorious days. These old cinemas still remain very affordable for the masses when compared to the new ones which charge a lot more. Do you think we should forget about investing in the old burnt down cinemas and instead of restoring them, aim to create more advanced multiplexes? Or do you think that where new technology is a great feature, the simplicity and affordability of the old ones should not be forgotten just yet? New York, Kaminay and My Name Is Khan couldn’t be more enjoyable anywhere else than the huge gallery at Nishat with best friends, dunking Bohri Bazaar samosay and pakoray in bags of chutney that we smuggled in and laid out on the foot-wide balcony wall that served as a table top for us. Do you agree? Or with the advent of new plush seating and flavoured popcorn, should we say goodbye to our dusty old cinemas and aim for bigger? How can the government help interested investors in facilitating Pakistani cinemas? Is security the biggest concern or do you think there is more to the downfall of our cinema houses? 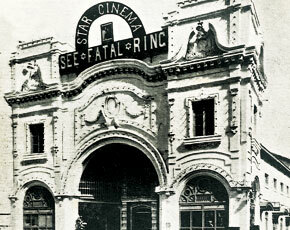 Most of all, do you personally consider our old cinemas as a heritage of Pakistan? And in one fatal blow, the curtains fell. The good times; the memories of friends and films desecrated, all gone to dust. The absolute disconnect shown by english media is not surprising. The mourning about cinemas in a country where basic needs of majority doesn’t get fullfilled we hearing every day the cinemas. How about we worry about basic neccessity first, ppl are watching movies in comfort of thier homes so don’t worry even without cinema the ppl can survive.